TOWERS reaching 32 and 27 storeys high are the first planned for the riverfront transformation at Belmont Racecourse. 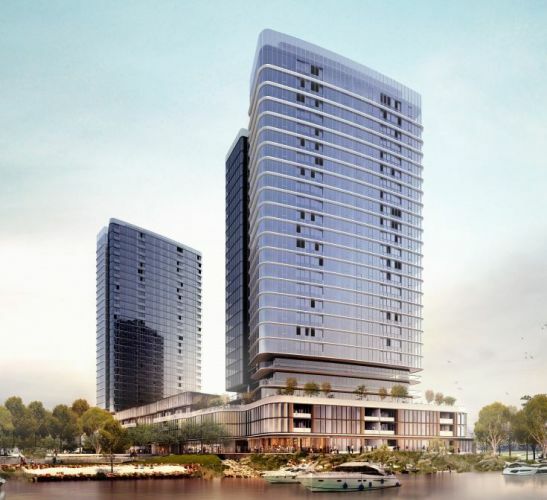 Golden Group has lodged development applications for the first two towers it intends to build on the Burswood Peninsula, directly across river from Maylands Peninsula Public Golf Course and on land currently occupied by the track’s horse stables. Under the proposal, the towers would have a maximum height of 108m, a total of 463 residences, parking for 585 cars and be built atop a three-storey podium. A three-storey podium will link the two towers. The complex would contain a mix of apartments with one to four bedrooms and shared features including a 50m lap pool atop the podium, with restaurants and shops on the ground floor. Just two submissions were put forward to the Town of Victoria Park during the recent public comment period, both in support of the plans. The application largely complies with planning requirements but would require some grace in regards to setbacks, overshadowing and the outer appearance of the car parking areas. The next step is for council planners to present a report and recommendation to the Metro Central Joint Development Assessment Panel. If all goes to plan, the first residents could move in 2021. But the first buildings are only a fraction of the $3.8 billion masterplan that is considered the biggest property redevelopment in WA. Golden Group claims its Belmont Park plan will “revolutionise” inner city living, with a longer-term aim to build a high-rise precinct with up to 4500 residential apartments, plus office and retail space. The area’s structure plan allows for towers to reach as high as 53 storeys. Managing director Andrew Sugiaputra said roads, infrastructure and public amenities would be complete before work started on the towers. Initial landscaping works alone will cost $5.5 million and include a man-made beach, boardwalks, an amphitheatre and other upgrades to the foreshore. “You’ll have six super lots all subdivided, all major infrastructure, roads, water, telecommunications, parks, foreshore, jetty will be all part of stage one, along with Perth Racing’s brand new horse stalls to the western part of the current grandstand,” he said. The apartments will be marketed towards families, downsizers and young couples interested in an inner city lifestyle with open space and facilities at their doorstep.